Did you think that the world would end on December 21, 2012, as predicted by the Mayans and have not thought on how to celebrate New Year’s Eve? Some of the main events scheduled for this New Year’s Eve in the main cities of the region has just been made public the last few days while many plans are still being defined. We’re going to propose some ideas to celebrate a fun New Year 2013 in Tuscany’s main cities, but for a more complete list, you can visit CapodannoinToscana.it (the website is in Italian). In Florence, for the last couple of years the city has organized musical concerts in several of the main piazzas in town, each with a different style of music. The one most of the younger crowd is looking forward to is the concert by the Italian group Subsonica which will start soon after midnight in Piazza Stazione. Here music starts around 9.30pm, first with the Passogigante and then with the Blue Popsicle groups. In Piazza della Repubblica, starting at 10pm, anyone can enjoy the concert by Nick the Nightfly Quartet, while the Piazza Santissima Annunziata will host the talented artists from the New York Gospel Spirit choir. In Largo Annigoni, also starting at 10pm, the Woodstock images from the past will inspire the music played for 6 straight hours. 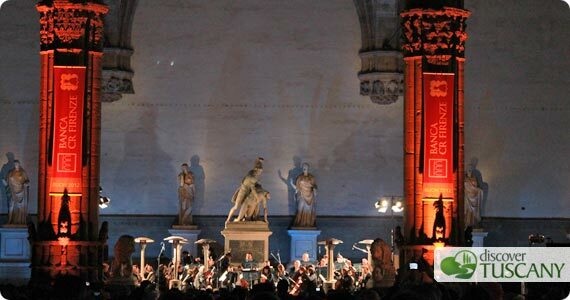 Finally, the Symphonic Orchestra of Lugansk will open the classical concert at 11pm in Piazza della Signoria. On December 31st at 6pm in Pisa, you can assist to the concert of the Italian singer Edoardo Bennato and then of the band Zen Circus. In Piazza Giotto in Arezzo during all festivities you’ll find an ice rink. On New Year’s Eve in Piazza Sant’Agostino there will be the comic actors of Zelig Off, a famous Italian TV program, and Filippo Graziani with his band. Starting from 9:30pm in Arezzo’s Fiere e Congressi area a long night with the Italian comedian-actor Paolo Ruffini and the staff of the TV show Colorado will start, including lots of music. Admission is free. Piazza San Martino is the perfect location of the traditional New Year’s event in Lucca. Here you will find music, entertainment and DJ sets until late. Siena proposes the event called “31.12.2012 … despite the Maya“. The celebrations for the New Year will be held in seven different parts of the city, including the beautiful Piazza del Campo, where you can assist different live concerts. All the scheduled events are free.